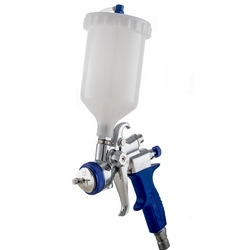 This is a light weight easy to handle and operate pressurized gravity feed non-bleed spray gun, that will give outstanding performance with all finishes. It has a 600 cc, (20.3 oz) nylon cup with screw on cap making it easy to fill and easy to clean by just running thinner through the cup and spray gun. This is a great spray gun for the automotive body shop, and bathtub refinishing trades or for anyone who wants a light weight easy to maneuver spray gun. It is a true HVLP spray gun not a conversion gun it will run off of any HVLP turbine. Makes for a great first or second spray gun. Because it is both gravity and pressurized it can spray heavy finishes even easier than the pressurized T-70.